We finished our remodel in May 2016. Our remodeling included removing all of the flooring - all the popcorn on the ceiling - all the window coverings and all of the bathroom from the studs up. All new LOW E high efficiency vinyl windows and doors were installed throughout. Our goal was to modernize our condo which was built in the late 70's yet retain the charm of our beach community. We replaced all of the tiled counters both kitchen and bathroom throughout the condo with gorgeous Santa Cecelia Granite (warm beige, gold with cherry flecks). We smoothed the ceiling - repainted throughout in warm neutral colors - replaced all the ceiling fans with new ones (bedroom and living area)- and all the ceiling light fixtures as well. - our vanity in the bathroom is now a medium cherry wood with centered bowl which really shows off the new Granite countertop. There is now a new tub, toilet, walls, surrounds, mirrors - everything. We lengthened the hallway between the vanity area and bedroom by 18 inches and added a door to the bedroom - removing the door to the main hallway (which no one ever used). The bedroom now is completely private with a nice walk in closet for storage. We replaced all the bedroom furniture opting for the darker richer colors of cherry hardwood. Added -flat screen wall mounted tv and new dvd players in living room and bedroom. There is some new artwork to top it off. Plus, a remote controlled electric fireplace in our master suite, and a ceiling fan on remote too. Our master is now a suite retreat -with a high end Cal King bed and if needed, a twin chair bed that will fit an adult as well as a child. It's a great place to relax. Our kitchen has new custom granite counters - new appliances, steel sink, counters and rebuilt drawers in our vintage original medium oak lacquered cabinets which we are quite fond of. The solid oak cabinets are simply impossible to find these days of veneers and plasticized wood so we opted to rebuild the shelving where needed adding pulls to keep finger prints to a minimum. Our flooring is now 75% grade 6 imported ceramic tile with a very high rating for the abrasive sands of beach living. The color complements our new granite counters beautifully. The bedroom is our only carpeted space. The carpet in the bedroom is very old... and scheduled for replacement next spring. Tropical grounds and ocean breezes await your arrival! Fern grottoes, waterfalls, fountains, Koi ponds, wooden bridges and strolling paths make North Coast Village a peaceful retreat. Add heated pools, romantic jacuzzi pools, a fully equipped gym with two saunas, game room with billiards, ping pong tables and we're just getting started on the amenities. Our complex is right on the beach - no roads to cross to get to the water. 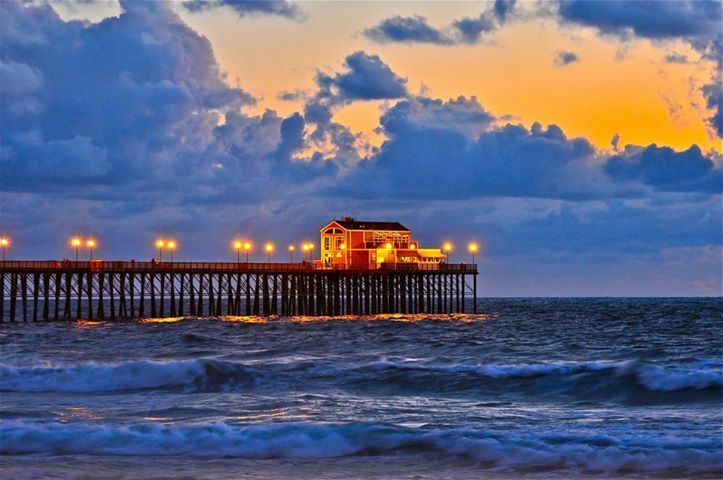 We're just across the San Luis Rey River from our quaint and active Oceanside Harbor. Our E building is arguably the most sought after in the complex ..sales comps prove that as well. Our unit is South facing and right over the putting green ..opposite the little decorative row boat for those familiar with our complex. No noise from roads, no lights of cars passing, no train noise...just peace-quiet and ocean waves. Stroll down to the seawall where you can perch on the wall at sunset and sip a glass of champagne as you watch the sun slide into the sea...or if you prefer, capture it all from the privacy of your own deck. At night you can watch the boats sail into the harbor with their lights dancing on the water. We provide sleeping for 4 people in beds that are off the floor. A double convertible couch bed in the Living room from IKEA offers sleeping for up to 2 smallish persons. The dimensions are for a 'full' mattress which is about 48-52" width. The other Chair Bed in the bedroom offers sleeping for one person - (twin) it is a full length twin. It's a nice option for those children who need to be close to mom and dad. We also have available a Pack N Play style Portable Crib for infant up to 30 lbs. Max occupancy is still 4 persons regardless of how you choose to use our sleeping options. Our condo is electronically equipped with amenities including High Speed Uverse (Aug 2015) WIFI with 18mps download speeds which is literally 3x faster than my prior pro DSL service. Its dedicated to our unit only, so it is safe, reliable and fast. New 2015 HD Flat Screens in both rooms . HD cox cable service, DVD components for watching yours or our videos. Our rental include linens, bedding, towels, beach chairs, mats, cooler, umbrellas, beach towels, and sand toys for toddlers.. In 2008 we had a custom dining counter built into the balcony and have several bar stools so you can now sit outside and enjoy a meal, cocktail or coffee while you watch the waves rolling in - the surfers - the harbor ships. Coin operated Laundry facilities featuring top of the line 'Neptune' machines are in our building. There is one car designated parking for each unit in a gated and underground parking garage close to each unit. Extra parking is available in guest spots - which have specific rules for use .. so ask us about that too if you have more than one overnight vehicle. Max vehicle height is 6'4" and maximum length is 21' per HOA regulations. Note! Effective 2016 there is no bike storage for non resident occupants (short term renters). Our Maximum occupancy in a 1bdrm condo is 4 persons and 6 persons for our 2bdrm unit this includes infants. No Smoking and No Pets -Strictly Enforced at all times by our Association Patrol. We have a 3 day minimum off season, and generally ask for 7 nights minimum during peak seasons or holidays. Generally we go Sat to Sat during the peak season because that's how the calendar starts to fill up .. but don't hesitate to ask for what you want .. we may be able to work it out. The earlier you book .. the better the selection of dates that will be available. Winter we prefer seasonal rentals, and offer a discount for 5-6 month rental Dec-May. We are at the beach - so it is WET here .. We use a dedicated housekeeper and laundry service. Our towels are very thin on purpose to allow them to dry overnight. We send our linens out to a professional laundry service nearby - then return them with the next change out. Linens and towels are inventoried before and after every rental. Please bring your own thin towel if you have time after check out to enjoy the beach. If repairs are needed please let us know! We have an onsite maintenance team avail to fix whatever goes wrong from plumbing to electrical. If you are missing something call us right away - we keep a storeroom on property with spare everything - from coffee makers to ceiling fans and can respond pretty quickly. We use the Shark steam cleaner system on our tiled surfaces to keep them clean and sanitary between our guests. We use Duvet covers on our comforters. We have pillow protectors on all pillows under the pillow case. We refresh our condo every year to keep them up to date and running well. We look forward to helping you plan your time in Southern California. We have been renting down here since 1988 and there is something going on all year long that is of interest. Lastly Please be wary of any ads you come across in popular sites like craig's list or facebook which ask you to send money in a wire transfer to Western Union, or cashier's check or money order. Sadly - every week during the summer months we hear about vacationers who thought they were getting a screaming good deal from Craigslist for their family vacation. When they arrive they discover that while the complex is real - the ad they responded to was fraudulent .. stolen .. and not from the real owners at all. If you find a deal that is TOO good - you should cross check with VRBO or even the homeowners association to make sure that the phone contact numbers match up. When you rent through VRBO you have booking guarantees! Dad's taking the picture - so here are Cindy and our boys - at North Coast Village Oct 16, 2010 for the wedding of our Niece which took place at the seawall - with the cocktail party on the E Deck and reception in the Party Room over the Koi Pond. We started coming down here regularly when our niece was born to be a part of her life and close to my sister and her husband. It carried forward into our buying a unit - then another and another. Before you know it -we had a rental business. It's all in the family now - with a total of 6 beach units between the two families .. four of them right here at North Coast Village. My husband is retired -and I'm getting there .. we have two lovely young boys to raise and just love being able to bring them down to the beach. The weather is spectacular all year long - there is so much to do - and see .. it really is a marvelous place to vacation. I've been flying for 38 years for a major airline - and have stayed in every conceivable type of room. I think I know what is important and what isn't. We try to maintain our units to a very clean - very comfortable and completely equipped status being mindful that our summer guests needs are very different from our winter guests needs. Our reviews tell us we're doing pretty good at that task. We wanted to be close to family - my sister initially had the only grandkids - Now her kids are grown and ours are little - so the shoe is on the other foot. She does travel up to visit us .. but we just love coming down to the beach to escape the snow in Tahoe where we live. It's the perfec balance - Snow and Surf.. who could ask for anything more? We are in love with Legoland at the moment - and have bought annual passes - they are an incredibly good deal - So.. when we come down we go there for 2-3 hours every day to let the kids play and run. We also get a kick out of the Wild Animal Park - a part of the San Diego Zoo.. it is only 10-15 minutes away and again - buying the annual zoo pass is a good deal .. and if you join by way of the zoological society - it is currently tax deductible too - and gets you free entry to both the zoo and the animal park. Last but not least - there is something special to falling asleep with the sound of the waves pounding .. it is soooo soothing. Our climate up North is very dry - when we're down here - our skin just slurps up the moisture and we feel so 'renewed'. Tub and Shower combination - Remodeled down to the studs in 2014 - all new tub, tile, fixtures, vanity, flooring, walls, paint, mirror and lighting. Our kitchen is full sized with self-cleaning range/oven, microwave, disposal and quiet kenmore dishwasher. Our appliances are all newer models. CABLE Tv Standard service provided through HOA - in both rooms and to all TV's. both bdrm and Living Room - Blue Ray Must be set to the correct INPUT on the TV - or the player will not work. First floor lending library in our building - bring or share with the library books in this room accessed with your community key. private balcony/deck with custom dining counter built in. NO STORAGE FOR BICYCLES. Due to problems with bikes in our community and in the storage areas- the HOA has banned all non owner occupant bikes. Bikes are also banned from placement on patios. Location in E Building of North Coast Village afforded nice views of ocean and pool on the sunny side. In spite of record rainfall during our January-March stay, we enjoyed many sunny and warm days. This unit could use some updates. A rug in living area would warm the place in winter. Kitchen needs better knives and utinsels. Bedroom could use new carpet. But overall it's a great place to be, and Cindy (owner) is very responsive to needs. My wife and I enjoyed beach walks, sun bathing, swimming, spa relaxing, and many activities from Newport Beach to San Diego. This is our 2nd time to the same unit! Amazing views and close proximity to everything. Close enough to the beach to hear the waves crashing while you sleep. Also very close to the pool, jacuzzi and parking. The property is beautiful and feels like a true escape! So glad our guests came back for another visit - and that they enjoyed their stay as much this time as last time. No rental is perfect - but good reviews do show that some rentals are pretty consistent in what they offer a guest. We look forward to YOUR NEXT visit! Thank you very much for posting a lovely review it is nice to know you enjoyed your stay. It's a simple condo with all the amenities for a beach vacation. We spent 90% of the trip at the beach and pool and not in the unit. Things are a little dated, (pillows & towels could be updated for sure), but I'm being picky for a space in a great location on property, and a few yards to the sand. Our guest got it right. It’s the end of our prime season and we do need to replace our towels and pillows ... but those little details pale in the light of our very attractive rates well below hotel pricing.. and our location is amazing! Our unit is right over the putting green dead center on the sunny side facing South and West .. views of white water and blue water but no noise from trains or lights from cars. Our furniture is high quality .. our unit was remodeled completely and we have great pricing too. Great property. Perfect location and amazing host! We had a great stay at this condo. The location was perfect and the owner was very accommodating. Weather was amazing for our stay and the view of the ocean and pool was absolute perfection. Thanks so much for a great vacation! Thank you so much for the nice review. This guest was particularly helpful when our uverse went down and we had to substitute WiFi and get a repair. Thank you for your assistance and graciousness. We are hopeful you will return. Very happy you loved our location in the complex. Our views are lovely! The first thing I have to say is that Cindy is a GREAT communicator. She responded to texts and emails promptly and fixed every little issue that came up. When the beach umbrella broke, there was a replacement the next day. The tub was draining slowly, it was fixed the next day. Outstanding customer service! The unit was very nice. Small, but perfect for vacationing. The only bummer was the pull out sofa was too small for both my boys (11 and 14 years old) to sleep on together. While the unit offered an additional twin pull out in the master bedroom, my husband and I didn't want them in our room so one slept on the larger sofa and the other on the pull out double. The view was beautiful and we enjoyed meals on the balcony. The beach was easy to access and the unit had all the beach toys, chairs, umbrellas we could want and a cart to pull it all. The unit offered 3 ice chest/cooler options to use during our stay. The walk to the harbor and many restaurants was short. The property grounds were lush and tropical. The property had many families staying there and the pool and spa were always busy in the afternoon. Thank you for the review! When things pop up or go wrong, we do our best to make it right again quickly. We have good private staff support, as well as on site dedicated repairman. Glad it was attended to quickly! NCV was wonderful! The accommodations very comfortable and so nice nice to look out and see the ocean from the patio. The sound of the ocean very relaxing and lulled us to sleep every night . The beach is right outside our door. The grounds are beautifully manicured. Sunsets WOW! Cindy quickly responded to anything and very accommodating. We will return!! This is the kind of review I love to read. A family found us to be responsive owners. Our condo was inviting, clean and comfortable for them. They found it to be a peaceful location with good ocean views and nice night sounds of ocean waves. They will come again, and had a great vacation. This is what we aim for with every rental guest. Thank you dear guest! You will always be welcome in our home. We are located ON THE BEACH, No roads to cross, All beach activities are here for your enjoyment including boogie boarding, volleyball, bike riding, There is a famous 15 mile long paved biking trail along the San Luis Rey River just across the street from us -, Then there is Hiking, concerts, kayaking all nearby, And, if that doesn't amuse you, there is the Del Mar Race Track (season starts in late summer) Del Mar Fairgrounds (June 15-July 4th is the annual Fair), Disneyland, Legoland, Universal Studios, Safari Land, SeaWorld, San Diego Zoo, Balboa Island, Mission Bay, and quite a bit more. Learn to surf at the local surf academy operating year round at the Oceanside Harbor. We can suggest boat excursions with local licensed captains including catamaran 3 hour sailings or established cocktail cruise on a bigger ship. Rates are subject to change up to the point of acceptance of a reservation. There are no refunds for cancelled reservations. Rates are for 2 person occupancy in winter - Extra fee for excessive winter electricity (anything over $50/month) Discounts are offered for 90-120 day winter rentals and tax does not apply and will be deducted from any quote of 30 nights or longer. No smoking complex...no pet complex... Cleaning fee is for a STANDARD 3 hour cleaning. EXCESS cleaning such as walls, flooring, furniture, appliances will be AS BILLED by our cleaning company to return the unit to the condition it was in at the onset of your rental. Guest must sign a short term reservation agreement ( 1-29 day rental) or a long term lease agreement (30 day or longer rental) provided by owner.